Real Estate Agency CMS Websites Real Estate and Property For Sale Web Designers for Agents and Property Owners! Call or email us to ask about our pricing on Real Estate Website Design that you can update yourself! Real Estate Web Designers - commercial, residential, and luxury real estate websites! 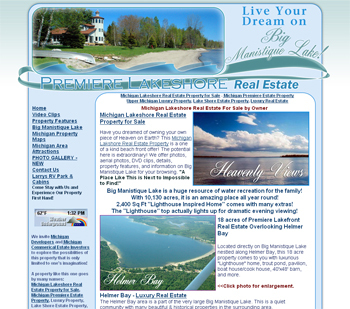 Luxury Real Estate located in Michigan's Upper Peninsula. This is the property that people dream of, 18 acres, lighthouse inspired home, 3 other cottages, dock, & tons of beachfront! Located directly on Big Manistique Lake nestled along Helmer Bay, this huge Luxury Real Estate Property comes to you with luxurious "Lighthouse" home, trout pond, pavilion, boat house/cook house, 40'x48' barn, and more. Big Manistique Lake is a huge resource of water recreation for the family! Big Manistique Lake has 10,130 acres, it is an amazing place all year round! CLICK TITLE ABOVE TO VISIT THEIR WEBSITE! CLICK "More Info" to view Photo and Details!